Hecklers and protestors interrupted Pope Francis' trip to a meeting of representatives of Paraguayan civil society in Asunción on Saturday afternoon. The Pope was received ecstatically and noisily at the meeting in the Leon Condou indoor stadium, at which campesinos and indigenous communities formed the largest contingents. 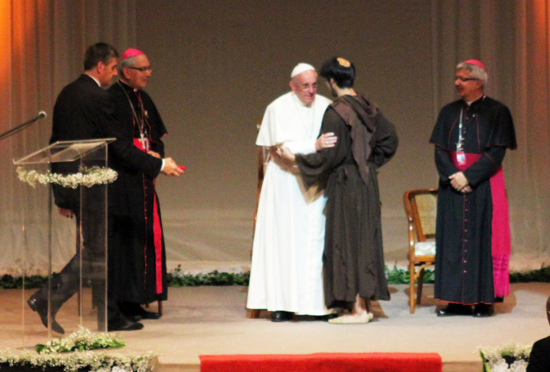 After some beautiful displays of dancing, poetry and music, including a ballet about St Francis of Assisi, the Pope’s speech took the form of answers to five pointed questions, and he focused on the importance of dialogue. Paraguay emerged only in 1989 from a dictatorship of nearly 35 years under President Alfredo Stroessner, and many attitudes and practices from the dictatorship are still current in the country. Free thinking was very evident in this meeting, as there was much shouting from the gallery during a presentation of macroeconomics in Paraguay by the economist Jazmín Gustale, while she was painting a very positive picture of Paraguay’s economic situation. She said that Paraguay had the second lowest debt in America, and that it was turning itself into the food producer of the continent, largely due to its high cattle production. “In Paraguay the cows are flying”, she claimed. Pope Francis in Paraguay: will rain stop play? Cattle production is associated in Paraguay with deforestation, and when the protests became loud the media pack turned their cameras around on the hecklers, and a banner was unfurled that read (in Spanish) “Curuguaty – watered with the blood of its martyrs”, referring to the peasants shot during a land protest in 2012, and their companions who are still in prison charged with conspiracy to murder, whom many believe are innocent. The Curuguaty massacre unseated ex-bishop Fernando Lugo from the Presidency of the Republic in 2012 through a “constitutional coup” and it remains Paraguay’s most high-profile, unresolved political scandal. 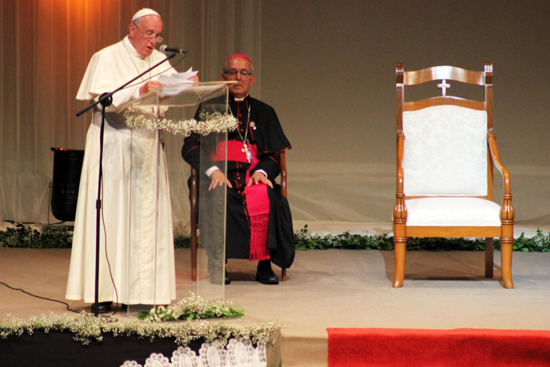 Pope Francis referred briefly and obliquely at the end of his address to the level of corruption in Paraguay, though “as there are politicians here, including the President of the Republic, I say it fraternally”. But “corruption is the moth, the gangrene of a people”.